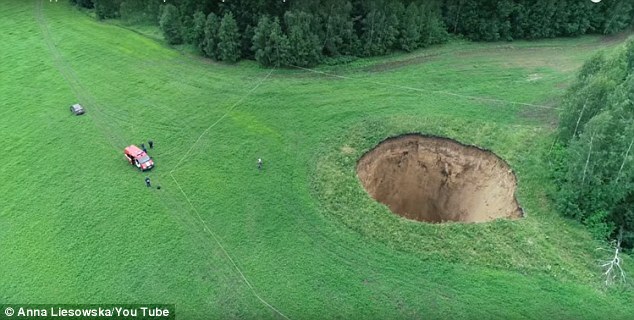 (Daily Mail) Mushroom pickers from a Russian village suffered ‘shock’ when they saw how a 165 ft deep hole had opened up in front of them. The crater – some 105 ft wide – is deep enough to fit a 16-storey building. While no-one was hurt, children in nearby Neledino village in Nizhny Novgorod region are having nightmares that similar sinkholes could swallow their homes while they are asleep, say locals.